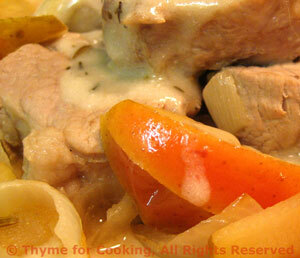 Thyme for Cooking easy recipes: Pork Tenderloin with Apples and Onions. There is something about apples, pork and fennel that just goes so well together. The apples will be very soft, but the skin will help them hold their shape for a lovely presentation. Thinly slice the onion and finely chop the garlic. Cut the apple into 12 wedges. Sauté onion and garlic in oil in nonstick skillet over medium-high heat until tender, about 4 minutes. Add fennel seeds and sauté 1 minute longer. Move onions to the side and add sliced pork. Brown slices on both sides, about 5 minutes total. Add apple slices around pork. Combine thyme, stock, wine and mustard. Pour over pork and apples. 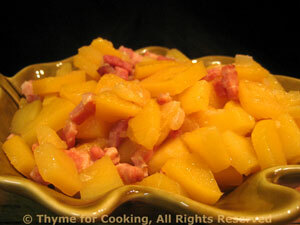 Uncover skillet and remove pork to small platter. Increase heat and add cornstarch mixture. Stir gently until sauce is thickened. Add yogurt and stir to combine. Spoon apples and onions around pork and serve. Cut in wedges, tossed with garlic and paprika, these oven fries are a flavorful and healthy alternative to traditional Fries. 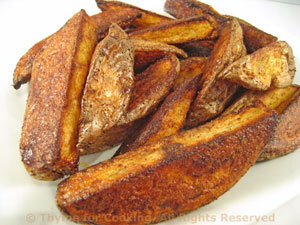 Slice potatoes the long way - a large potato into 8 wedges and small ones into 6. Put oil, vinegar, garlic and paprika into a large bowl and mix well. Arrange potatoes on baking sheet with rim (I use my trusty, round pizza pan). Bake at 400F for 30 minutes. You can turn once if you like to fuss but I usually don't bother. When done remove from pan and sprinkle lightly with salt and pepper if you choose (I don't) and serve. These will stay hot for awhile so a 5 or 10 minute delay is okay.